Mother nature finally blessed us with a warm day in NYC – yippee! While I am not going to fall into another “sunny day trap” (and dry clean my coats for the season), I will however, cook to celebrate this ephemeral yet exciting occasion because I miss the summer oh so much. For those of you who aren’t familiar with Tahini, it’s really just a fancy name for grounded sesame paste. This fragrant condiment is common in Middle Eastern dishes (like hummus), but I’ve added a little soy sauce twist to this and created a nice Asian noodle meal. Served at room temperature, this extremely versatile dish is perfect for cooling down in warm weather. You can find tahini at your local ethnic food store, Whole Foods, or Amazon! – Fill medium sauce pan with enough room temperature water to cover the chicken breast, you may salt the water if you’d like. Place chicken breast in sauce pan with room temperature water on low-medium heat for 15-20 minutes, allowing the water to come to a nice simmer (but not boiling). – While the chicken is cooking, mix tahini, soy sauce, and water together in a large mixing bowl (enough to contain your noodles and ingredients for tossing later on), to create a nice and creamy sauce. Chop up the cucumbers if you haven’t done so already. – Check the chicken and make sure it’s cooked through in the center, remove from sauce pan, and rinse under cold water. ‘Tear’ the warm chicken breast into strips. – In a small sauce pan, place water on boil and cook the noodles according to manufacturer’s instructions. Rinse noodles under cold water once it’s cooked through and strain. – Place chicken & cucumber strips and noodles into the large mixing bowl with sauce and toss well. 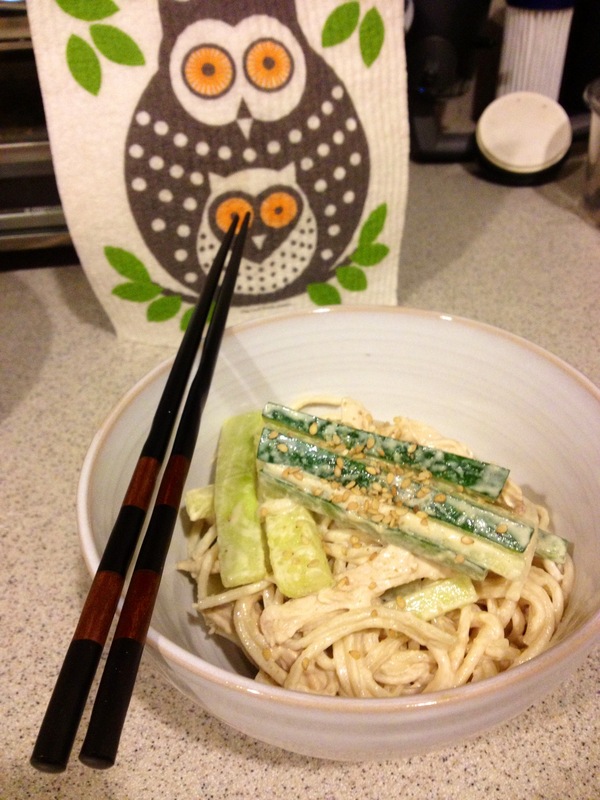 Serve immediately and sprinkle your noodles with some sesame with sea salt for garnish! – For a vegetarian version of this, you can substitute the chicken with strips of extra firm tofu. I would mix in just a dash of soy sauce and sesame oil to give it extra flava! – If you made too much chicken and cut up extra cucumber, I would recommend storing them in separate containers. Otherwise, your cucumbers will get soggy! And don’t mix in the noodles with sauce either, I would cook up the noodles when you’re ready to serve the leftovers. Thanks for that great tip Angie! This dish is delish, and perfect for warmer days. I could eat it every week in spring or summer.